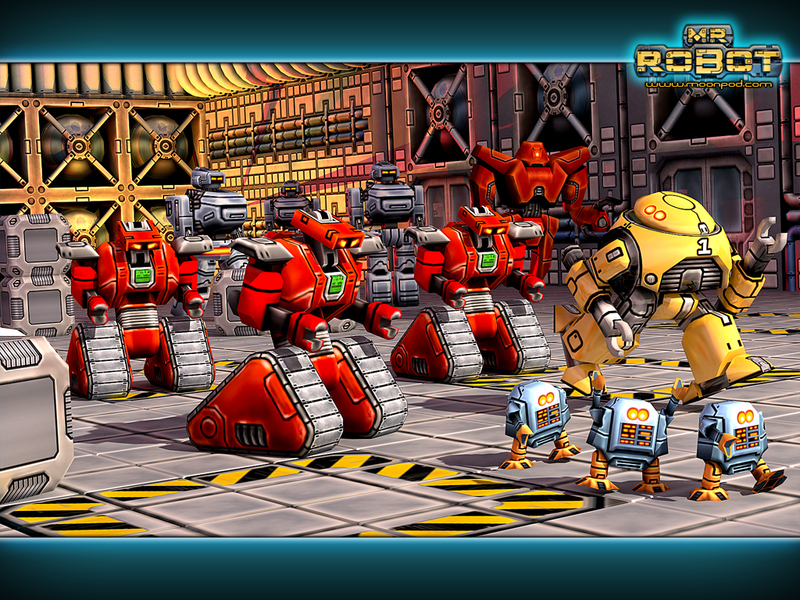 The bulk of this month has been spent finishing all the animations for the robots that need to be animated. The robots who help you in particular have a lot of animations as they also appear in the ghost hack mode, so need an additional set of animations: ICE breaker attack/program attack/damaged/deactivated etc. The hardest thing has been walk cycles though. I usually want to inject a bit of personality into the walk as the way someone walks says quite a lot about them. Serious weight for the heavy lifter, a slight limp for the older mysterious security droid etc. However, that pretty much went out of the window as in some cases, due to the robot's design, just getting them to move in even a vaguely believeable, physically possible, manner turned into a technical nightmare. 1: Some of the robots have limited degrees of freedom compared to a human. Samson for instance cannot move his shoulder joint in an outward motion, and Raistlin has the same issue with his hips. Normally, as the hips and shoulders become slanted in a walk, the joints compensate to keep the legs and arms straight. With fixed joints, they tend to flail out more, which is a particular problem with leg joints. When designing robots - it's best to allow as much freedom of movement as possible without compromising your design, as you'll save time later on during the animation phase! 2: Samson and in particular Orgus, have very short, and very fat legs, with massive feet! When feet are longer than the leg it's almost physically impossible to bend the leg, and swing it forward to make a walk. Anyway, here's the keyframes (most are on 16 key frames) from the final walk set. the game smooths the animation out by calculating the inbetween frames and morphing between them. Samson and Orgus were definitely the two hardest models to animate. Samson has quite insane proportions - feet as long as his legs, arms that go past his feet, and hands as big as his body! Orgus' foot mechanism has so little room for manouvre that he pretty much shuffles along. Raistlin, Zelda and the enemy stalker robot. Being much more of humanoid proportions made these much easier, although the lack of feet on the stalker initially worried me, it proved not to be a problem. So there you have it - feet are a complete waste of space! I've been looking into how we will handle widescreen aspect ratio in all future games. 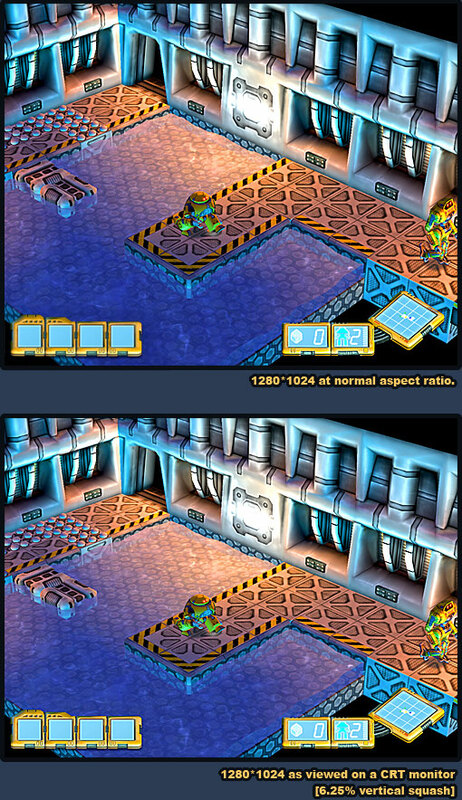 This is something we don't have in Starscape as switching resolutions is not so easy due to its 2D sprite based nature. Also, in the past, there have been very few people using widescreen monitors, mainly a few laptop owners who had top end systems. With most laptop manufacturers moving toward widescreen displays now (so the laptop can double nicely as a portable DVD player), and flat-panel, widescreen desktop monitors dropping in price (I'm waiting for this 30" beast to drop to street prices ) now is definitely the time to be supporting widescreen. Widescreen displays highlighted in yellow showing that just shy of 7% of the people viewing our website lately have been using wide format displays. Not a huge amount, but enough to warrant supporting that kind of display. Also, this figure has doubled in a very short space of time, and I expect it to grow massively over the next few years. Mr. 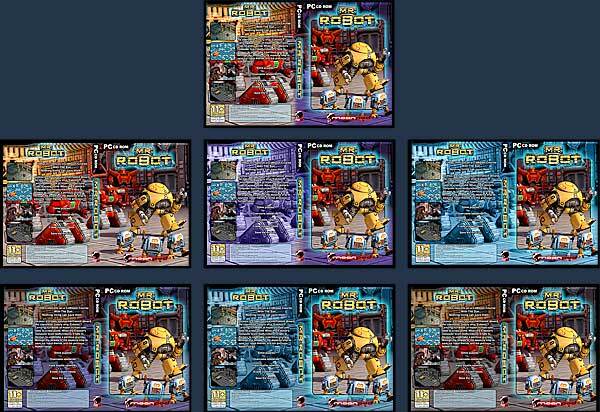 Robot currently supports any resolution, but the virtual camera's aspect ratio is locked to 4:3. So I needed a way to set wider fields of view. My ideal choice would be to determine this automatically, but failing that, give the user a wide range of options so they can sort it out themselves. The first thing that I did was to compile a list of resolutions currently in use, which ended up confusing me even more! Some laptops are actually 16:9 ratio, and some are even 16:10! What's more, Fullscreen 1280*1024 running on a CRT monitor is squashed to 4:3, yet if you run it in a window it has square pixels, and is a different aspect ratio. Flat panel monitors always seem to have square pixels, so a flat panel monitor with a max resolution of 1280*1024 is also a different aspect ratio . The useful fact there however, is that widescreen flatpanels have square pixels. In the end, I've decided that the best thing to do, is to assume square pixels (which is what Windows desktop does anyway). So, just get the desktop aspect ratio and set the camera fov to the same. The only time this will cause a slight discrepancy is with fullscreen 1280*1024 (A popular but silly resolution; it should be 1280*960) on a CRT monitor. Luckily, there's no noticeable difference between 1280*1024 squashed to 4:3 (like on a CRT monitor) and 1280*1024 with square pixels (5:4) like on a flat panel. Just a 6.25% vertical squash only affecting CRT users at that res. Should be able to support that in all future games, and in an update for Mr. Robot if not at launch . 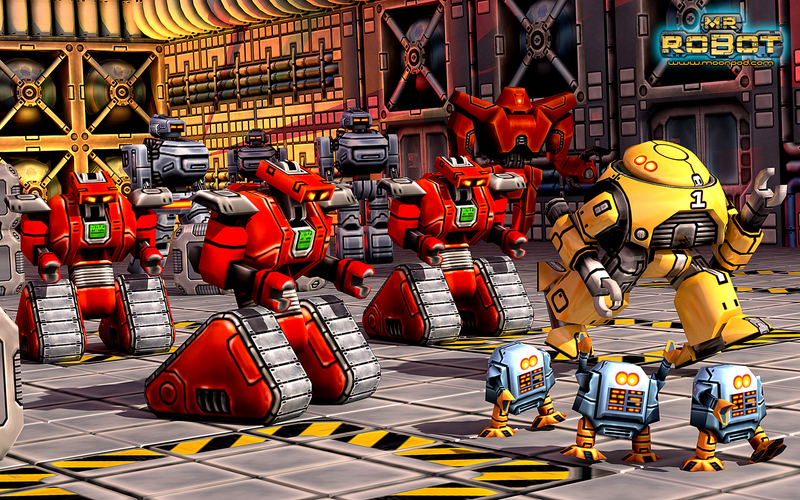 You say there's no personality for the animation of the robots, Nick, but I think that their design and shape give them plenty of personality. I just showed the animations to a co-worker, and he was very surprised when I told him this was an independantly developed game. I think I've been repeating this with every dev diary, but it's looking incredibly polished and eye-candy-like. The DVD cover picture is also really good and a decided improved on the first one. I liked the first one as well, to be honest, but this is much more dynamic and really pops out. Let's hope I get a Mac Pro at some point and a 30 inch cinema display. I'll look forward to taking advantage of all the resolutiony goodness! EDIT: Did I ever tell you how much I like those names and their representation on the robots? Pretty classy. I like the little ones at the front! I think gamewallpapers.com do widescreen wallpapers now. And two-monitor wallpapers too! I had a go with the cover picture for a windows wallpaper, and even though it's very pretty, I have to say it's not much of a wallpaper. At least to someone like me, who enjoys a sense of order on their desktop. But hey, it's not like you made it to be a wallpaper anyway. It looks great on that tiny cover preview, and that's all that matters. I have absolutely no clue how that works - it's all part of google analytics, which has given us lots of raw data to wade through! Ah, that explains the bits I couldn't work out! It loads a 1x1 pixel GIF in the background from Google and attaches all sorts of info in the query-string using script: screen res, colour depth, whether you support Java, whether you support Flash and which version, etc. Neat. So does this all mean you're close to wrapping up Mr Robot? Or the alpha version at least? Does the stalker re-use anything from the talos? No, I can see what you mean though - the chest is a similar shape. Totally new model though. because ghost hacking piece of game like Rez/Darwinia in aspect. We are definitely on the home straight - all major tasks are now complete, and it's really now all about attacking a big lists of little things that are missing, bugs, and things that come up with playtesting (expect my dev diary to get pretty dull from now on!). One thing that has worried us is we have still not played through the game in it's entirety in one go, which is somehting we managed very early with Starscape. We've played large sections of it though and they are good so we aren't to concerned. Mr. Robot doesn't have any playtest issues where somehting you do in one area massively affects other areas (like the way mining barges move through the maps in Starscape), so if one room works ok, it should slot in anywhere, and the only concern is difficulty. Fingers crossed.